G.A.A. is involved in a board range of architectural services in the area of Space Planning, Tenant Development and Commercial Interior Design Services. As we see more evolving ‘high performance’ buildings in the near future, Ana Alas has become a LEED accredited professional, rapidly gaining the expertise required to coordinate the documentation process that is necessary for LEED Commercial Interior Certification. In this increasingly competitive business and development environment, top notch professional design services are indispensable in the successful marketing of a corporate identity. Our design goal is to attain a better functional effectiveness through a deep understanding of the client’s operational requirements and corporate image. Beautifully encased in a glass box, the internationally renowned company’s Latin American office exemplifies the corporation’s vision for healthier lives and happier homes. 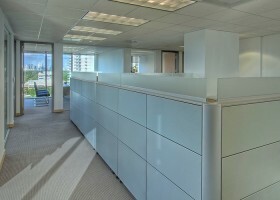 This 4,500 square foot office is composed of a centralized board room, surrounded by administrative offices each with its own lush view of Coconut Grove. The translucent partitions diffuse natural light into the entire office space; while the subtle color palette enriches bold motivational posters, highlighting the contemporary nuances intertwined with the understated tropical style, typical of the countries this branch represents. Located in heart of downtown Coral Gables, the dynamic design of this 11,000 square foot business center provided the ideal working environment for a group of international entrepreneurs and real estate investors. 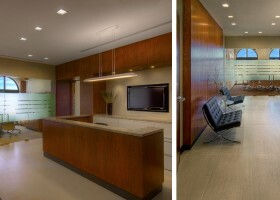 The metal accents and contemporary details are reflective of the corporation’s mission to provide their clients with the most up to date technology, while the warm Zebra wood veneer and brightly colored furniture pieces offer the flexibility and elegance for their various multicultural clientele. Scope of work included designing and furnishing over 30 offices, 2 multipurpose rooms, technical data centers and a formal break area, all of which are anchored by a spacious centralized conference room overlooking the downtown skyline. Set against the dynamic Coral Gables skyline, this 2,000 square foot investing firm juxtaposes strong modern vocabulary with understated personal touches. The broad arched top windows and natural light create a spacious work environment, while contemporary accessories play off the bold color selections, removing any notion of a stifled office. Scope of work included designing and furnishing 3 offices and a break room, separated from the rich wood veneered reception area furnished with Barcelona chairs. Stripes of film were added to the face of the conference room glass wall to emit light into the reception area, while still maintaining privacy.